The Bounce Backs, from left to right: Charlie Schlappi, Jeb Raulston, Forest Huls, Spencer Poore, Charles Roitsch. In the field of medicine, a Bounce Back, a patient discharged from the hospital and readmitted soon after, is to be avoided. On the local music scene, it's just the opposite as a trio of residents defies the stereotype of perpetually exhausted young doctors. Third-year pediatric residents Drs. Jeb Raulston, Spencer Poore and Charles Schlappi, all at Children's Hospital, may be overworked at times, but when they have a moment of respite, music is the ultimate decompressor. "It's pretty unique to have a group of guys who went to medical school and settled on pediatrics and have strong musical backgrounds," Poore said. "We all bring different aspects from our lives and music to the band, and we're all pretty talented. It's also a fun way to hang out with people." All multi-talented instrumentalists, Raulston plays bass; Poore plays bass, banjo and mandolin; and Schlappi sings and plays harmonica. 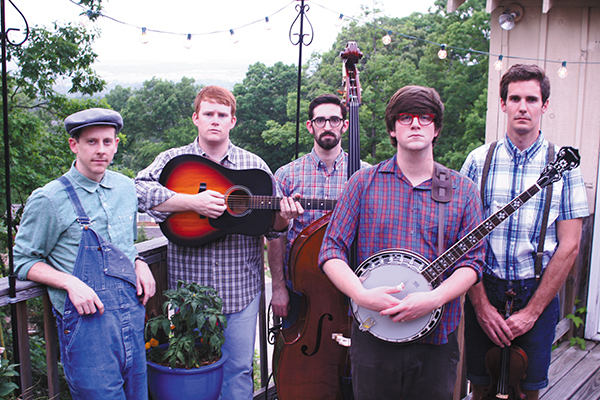 Their sound is mostly country and folk with bluegrass covers of classic rock songs in the mix. "We met at an intern retreat before we even started our residency,"Poore said. "We first started playing piano and guitar together and then started getting together on weekends and making music." Poore has a background as a classical pianist and embarked on a garage band tour with friends while in medical school. Raulston played honky tonks while in college in Nashville. Schlappi's father is a Nashville-based country music songwriter. "Charles had hidden talent," said Poore of the band's vocalist. "As soon as he opened his mouth, we were blown away. Both of his siblings and father are accomplished musicians in Nashville. When we knew he had a knack for it, and we were forced to do something about it." In the early days, Drs. Charles Roitsch and Forest Huls, residents who have now moved on to fellowships in other parts of the country, also played in the band. "We all have different musical influences, so it's fun to get together and play each other's favorite songs," Raulston said. "In medical school, we had no time to play. It was refreshing to come into the residency and find others to play music with." During the first year of residency, the band performed at department and neighborhood parties, and fundraisers. Their breakthrough was the Children's Hospital Spring Scramble, a fundraiser for the department of pediatrics. "We wrote out a set list and then played music in the parking lot," Poore said. "People were really surprised. After that, they would ask us to show up, and we would bring expensive equipment we rented and things we slapped together. It's a good way for us to get away from a lot of the sadness we see in our jobs. When we get together, we can do something we enjoy." The Bounce Backs like to perform at restaurants, bars and fundraisers. If they don't have a gig, they'll just hang out on Poore's front porch for an impromptu jam session. "One of the more fun concepts we've done was to play the Department of Residency reunion party," Raulston said. "Several hundred people attended, and it was great to see people return to the community. It was fun to see their reactions. A lot of our bosses were there." "Now they see a different side of us, after dealing with us for two and a half years in medicine," Poore said. "It was an awesome experience." For two of the trio, the demands don't end with the endless hours of resident work. Poore has a wife and two-year-old daughter. Raulston and his wife have an 11-month-old daughter. There's also the challenge of finding mutual openings on their calendars. "The hardest thing is working out our schedule," Poore said. "Every fourth day, Jeb is in acute care and can't get away. Schlappi and I have heavy responsibilities with inpatient rotation. We've all come together to play even after we've been up all night with work, and we all enjoy it enough to play with little or no sleep. Residency is tough, but the band is fun and makes it a lot better." For the Bounce Backs, it's more about the camaraderie than a moment in the spotlight, especially knowing their time together at Children's is finite. Despite juggling careers and family, the young docs are looking to expand their exposure in Birmingham-area venues. "Tell your friends we're eager, cheap, and we like to play," Poore said. "We're all here for another year. I'm doing a chief year and the other two are in a fellowship year. We've got keep our day jobs, but we still want to play music."